SIOUX CENTER – Many families take buying baby necessities such as diapers, baby wipes and pacifiers for granted. But some families struggle to afford these items. 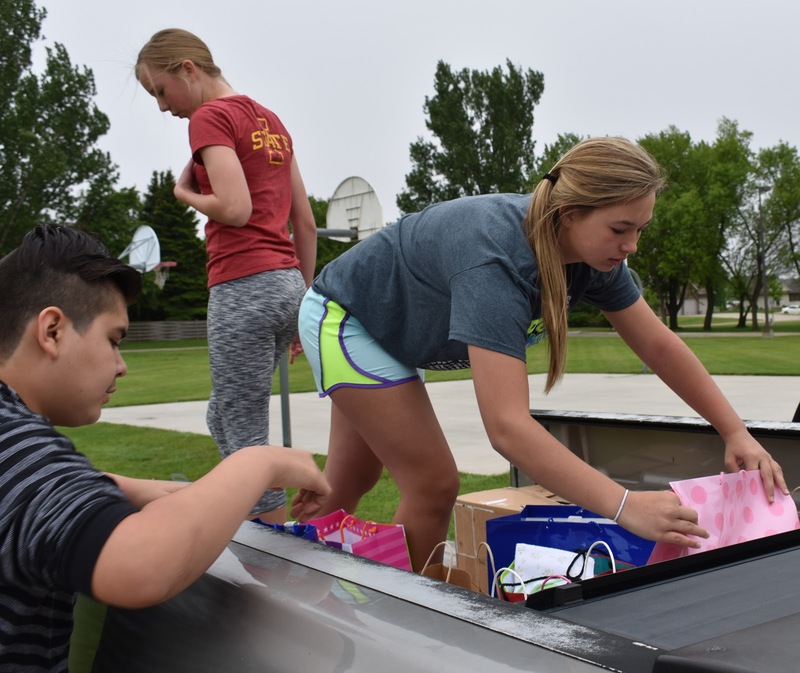 A group of seventh-graders at Sioux Center Middle School took it upon themselves to help out these families as their May Term project. They collected donations of various baby items and packed 20 Baby Bundles full of the necessary items. They donated the bags to Promise Community Health Center in Sioux Center to provide to moms who have a special need for the items after the birth of their baby. Seventh-grade teacher Jill Harskamp said it has been fun watching the students work as a group and interact with adults in the community on the project. As part of the May Term projects in the middle school, each seventh-grade student was asked to research local ministries or nonprofit organizations and choose one that they wanted to earn support for. Each student then wrote a persuasive essay and gave a presentation to their classmates as to why their organization was worthy to be selected for support. The class then took a vote, and Promise was selected as the organization of choice for one of the seventh-grade’s four sections. Chris Trejo was the student who persuaded his classmates to support Promise. He said he wasn’t expecting such a positive response to his presentation from his classmates and was surprised to have his cause selected. But he is glad it was. Each seventh-grade section was given $100 in seed money from various donation sources to start their project. Derrick Vander Waal, the public relations officer for Promise, came to speak to the students about the health center and offered various ideas for projects. The students then chose putting together Baby Bundles as their project. The seventh-graders compiled a list of needed baby items. They brought in items, they sought donations from students in the other grades at the middle school, they placed a donation box at Interstates in Sioux Center and they purchased some items. 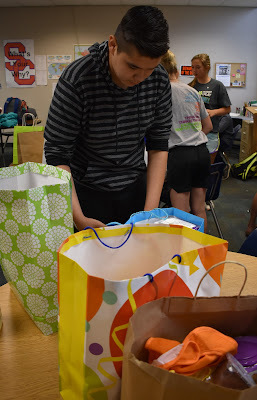 By the end of six days, the group of students had enough items to fill 20 large gift bags today (Thursday, May 24). They also provided Promise a box of leftover items to use to supplement other Baby Bundles in the future. Harskamp was impressed by the initiative the students took with the project. They discussed amongst themselves and decided what project they wanted to do. They also determined how they were going to go about accomplishing their goals based on the financial and human resources they had available. She said the process has been good for them. Promise appreciated the students’ effort on the project. items to give to moms of newborns. The Sioux Center Middle School seventh-graders also hung up many posters throughout the school to promote Promise Community Health Center’s seventh annual Wellness on Wheels Bicycle Ride (WOW7) as a side May Term project. WOW7 is planned for Saturday, June 3, as part of Sioux Center Celebration Days. To learn more, read this story: https://promisechcnews.blogspot.com/2017/04/wow7-offers-four-great-bicycle-routes.html. 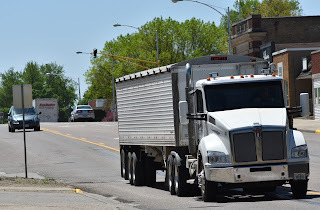 SIOUX CENTER – Truckers now have another option when it comes to getting their Department of Transportation medical exam completed. 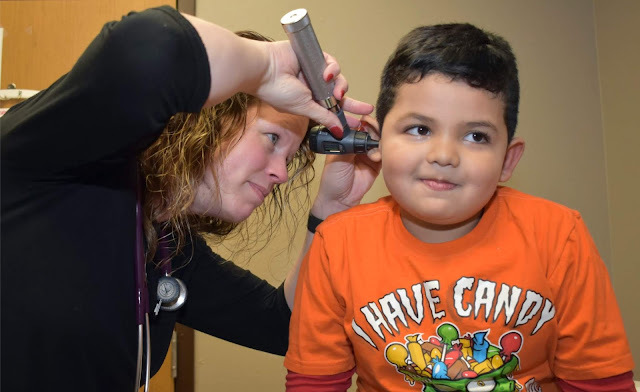 Promise Community Health Center of Sioux Center is offering DOT physicals as a new service. for Promise Community Health Center. 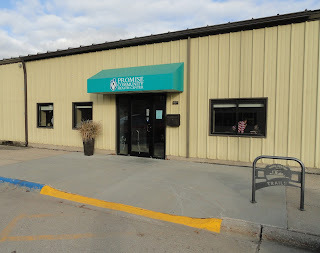 Roleen Walgenbach – who will begin serving at Promise as a part-time nurse practitioner on Friday, May 19, and who is a certified medical examiner for commercial motor vehicle drivers – will provide the service 8 a.m.-5 p.m. on the first and third Fridays of each month. In addition, she will offer the service any other times she is seeing patients at Promise. To make an appointment, call Promise at 712-722-1700. All CMV drivers must have a DOT physical examination completed by a licenced medical examiner who is listed on the Federal Motor Carrier Safety Administration National Registry to obtain a commercial driver’s license (CDL). The DOT medical examiner’s certificate is valid for up to 24 months. Nancy Dykstra, executive director for Promise, is pleased that Promise can fill a community need with Walgenbach’s service. motor vehicle drivers as a new service. Dykstra added that Walgenbach enjoys doing the DOT physicals, so she will be good at them. Call 712-722-1700 to make an appointment for a DOT physical at Promise Community Health Center in Sioux Center. Nurse practitioner Roleen Walgenbach will provide the service 8 a.m.-5 p.m. on the first and third Fridays of each month. In addition, she will offer the service any other times she is seeing patients at Promise. To learn more about Roleen Walgenbach, Promise Community Health Center's new nurse practitioner and certified medical examiner for Department of Transportation physicals, read this feature story. 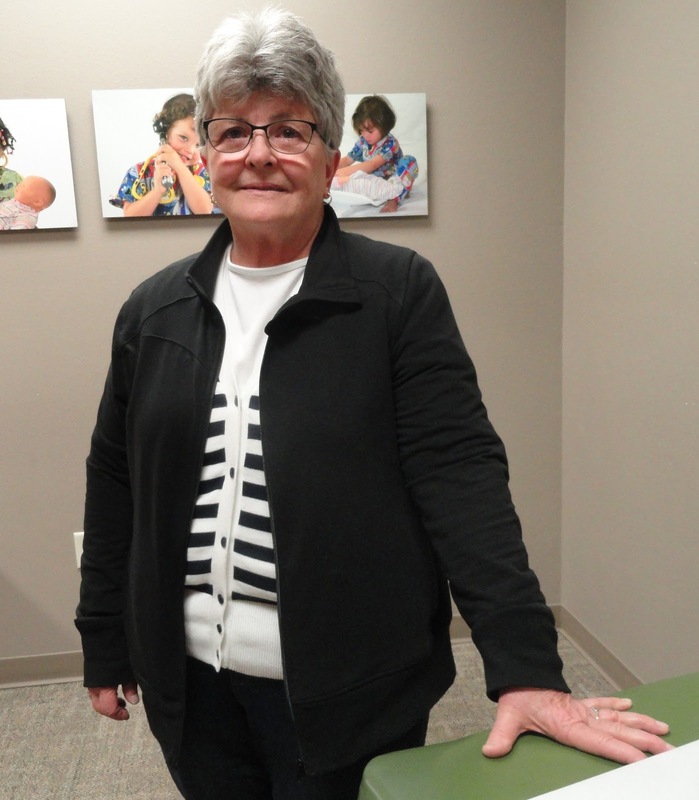 SIOUX CENTER – Roleen Walgenbach has a passion for reaching out to the medically underserved in a community health setting. She has dedicated her career to it. Walgenbach has cared for patients for over three decades on the Leech Lake Reservation in rural northern Minnesota – first as a public health nurse and later as a nurse practitioner. During that time, she has served for Leech Lake Reservation Health Division and Cass Lake Indian Hospital. She has experience in both in the clinical and administrative settings. service offered by Promise to the community. So, Walgenbach will fit right in as she begins her service at Promise Community Health Center in Sioux Center as a part-time nurse practitioner. She will fill in when Promise’s other providers are on vacation and other times that she is available as she divides her time between living in Iowa and Minnesota. In addition to seeing regular patients, Walgenbach will conduct Department of Transportation physicals for commercial motor vehicle operators. Serving at Promise will be a homecoming of sorts for her. Walgenbach also served previously at Promise as a part-time provider from April 2010 to July 2012 while helping her family care for her mother, who was a lifelong resident of Hospers, in the final years of her life. “Promise is offering such a needed service to the community, and I am thrilled to be able to participate in its mission,” she said. Nancy Dykstra, executive director for Promise, is ecstatic to have Walgenbach return to Promise to serve as a provider on the locum basis. Fulfilling the mission of reaching out to the underserved has been Walgenbach’s dream ever since she was a child. Back then, she envisioned being a missionary in a developing country. She read and reread Tom Dooley’s books that described his work as a physician in Laos and Vietnam many times. “I think that influenced my choice of becoming a nurse,” she said. 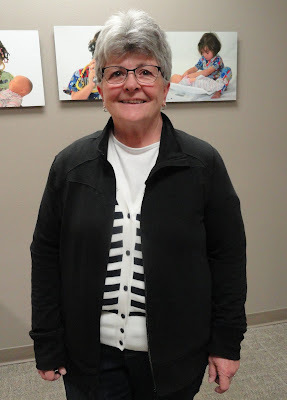 Walgenbach earned her bachelor’s degree in nursing from the University of Wisconsin in Madison in 1971. She then worked as a nurse at various location in Wisconsin for many years, sandwiched around earning a master’s degree in liturgical studies from Notre Dame University of South Bend, IN, in 1977. After 10 years working as a public health nurse, she decided to take that personal care a step further by becoming a nurse practitioner. Walgenbach, who previously received a second master’s degree in public health from the University of Minnesota of Minneapolis in 1991, went on to earn post-master’s degrees from Winona State University of Rochester, MN, as an adult nurse practitioner in 1995 and family nurse practitioner in 1997. She then put those to use by serving as a provider in various capacities on the Leech Lake Reservation. She now looks forward to caring for patients at Promise. Her first day will be Friday, May 19. She also is pleased with how effectively Promise is reaching the community’s increasingly diverse ethnic composition. Walgenbach loves caring for people throughout their entire lifespan. “At this time in my life, I really like making connections with people and working as a partner with the patient in restoring and maintaining health,” she said. Roleen Walgenbach lives in Hospers and Bemidji, MN. She loves reading, especially the mystery genre; working outside; fishing the “unscientific” way with just a worm and hook; and riding bicycle. 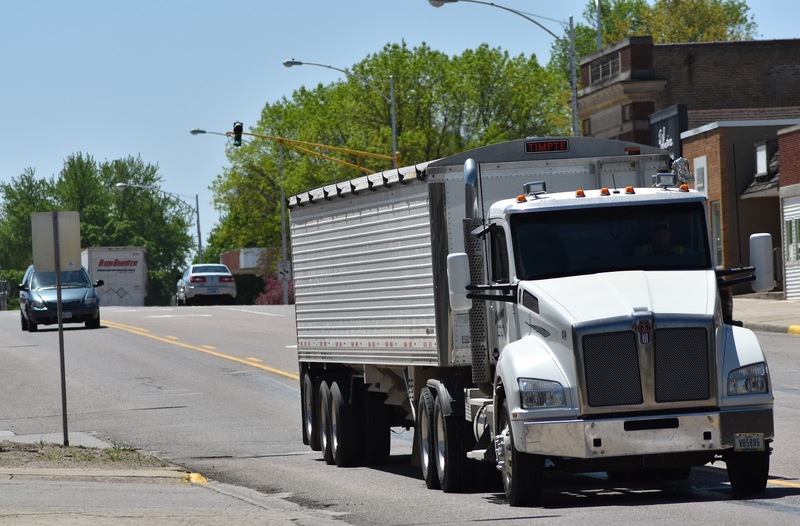 Promise Community Health Center will begin offering Department of Transportation physicals for commercial motor vehicle operators as a new service. Nurse Practitioner Roleen Walgenbach, who is a certified medical examiner for CMV drivers, will provide the DOT physicals 8 a.m.-5 p.m. the first and third Fridays of every month. In addition, she will offer the service any other times she is seeing patients at Promise on a part-time basis. To make an appointment, call 712-722-1700. SIOUX CENTER – Thanks to many generous donors, Promise Community Health Center has reached the fundraising goal for its 2016-17 capital campaign project. As a result, a major exterior renovation project will commence soon. And, soon, the deteriorating, yellow, steel exterior of the former bowling alley building in downtown Sioux Center will fade into a memory of the past and will be replaced with a much more inviting – and modern – brick and EIFS finish. and individuals during a successful capital campaign. Promise has been located in the building at 338 1st Ave. NW since opening in July 2008. Since then, it has continued to expand in services and facilities to best serve the needs of patients. In December 2015, Promise officially purchased the building that it had leased throughout its history. With the purchase, Promise decided that it was time to enhance the integrity and aesthetics of the building to preserve it for future generations. Therefore, after much planning and design work, Promise launched a $250,000 capital campaign for the exterior renovation project during its eighth annual “An Evening of Promise” Celebration and Fundraiser on Nov. 3. The health center committed to 50 percent of the cost, but it appealed to the greater community to donate the remaining funds – or $125,000 – to make the project a reality. Due to the generous donations of many individuals and businesses, that goal has been met. And Promise is deeply humbled and thankful. Schelling Construction of Sioux Center will serve as the general contractor for the project. Kevin Schmidt of Tucket’s Design of Sioux Center offered his design services. All four sides of the building will be renovated, including the north wall where Los Palmas Mexican Grocery Store is located. The bottom third of the exterior walls will be brick, and the top two-thirds will have an EIFS finish. Promise’s awnings on the west and east sides will be replaced with a modern lighted feature. Los Palmas’ awning will be removed, and a new entrance will be installed. A new front doorway and new floor-to-ceiling windows will be installed on the west side to bring in additional daylight to Promise’s reception area. Artificial tree architecture, illuminated by lights, will grace the west, south and east sides of the building to create a modern and inviting look. Sidewalks will be reconstructed to enhance safety. Dykstra said the construction shouldn’t affect patients too much – other than possibly being redirected through a different entrance for a day or two. “We will do everything possible to minimize disruption to patient care and everything possible to maximize safety,” she said. Most importantly, she thinks the project is another positive sign of Promise’s growth as it fulfills its mission in the community. 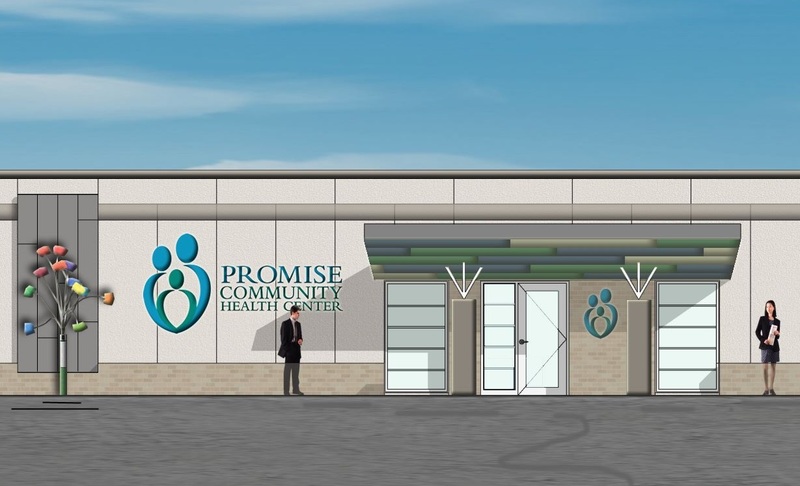 Nearly 90 individuals or businesses donated to Promise Community Health Center’s capital campaign for its exterior renovation project. Many other individuals and businesses also will be recognized on a Wall of Honor – created in the form of a tree – in Promise’s front reception area. The donors’ names will be etched on stones at the base of the tree for giving levels between $5,000-$9,999 and on leaves of bronze, silver and gold on the tree for giving levels between $500-$4,999. SIOUX CENTER – Promise Community Health Center of Sioux Center will replace one of its aging dental chairs, thanks to a $2,500 grant from the Sioux Center Community Foundation. The grant, which comes from the foundation’s new Generations Community Endowment Fund, was awarded during the Sioux Center Spirit of Community celebration on Thursday, April 27, at Terrace View Event Center. Promise was among 12 local, nonprofit organizations that received a total of $26,000 in grant funding. new dental chair purchased and installed during 2016.
go toward replacement of a second dental chair unit. The grant will cover about 15 percent of the cost to purchase a new dental chair and associated accessories for one of Promise’s three oral health exam rooms. Promise accepts all patients, but in particular, it welcomes people covered by Medicaid and those who do not have insurance. For patients without insurance or with high deductibles, Promise offers a sliding-fee scale that greatly reduces dental costs. Promise also has a bilingual dental assistant integrated into its dental team to best serve Spanish-speaking patients. As a result, Promise is a place where patients who otherwise would have difficulty accessing care can be referred. “Promise fullfills an important community niche by ensuring families and children can receive the dental care that they need,” Vander Waal said. Promise purchased refurbished dental chairs for its three dental exam rooms when it launched its oral health services in January 2011. The chairs served Promise well but were nearing the end of their useful lifespan. One of the chairs was replaced in 2016 through the help of a Sioux County Foundation grant. Now, a second can be replaced. Along with the chair, a dental delivery unit and instrumentation will be purchased as necessary accessories for a complete dental system. see a dental patient at Promise CHC. 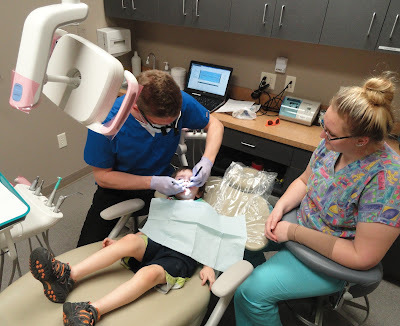 Promise Community Health Center of Sioux Center offers dental care five days per week. Promise’s dental staff consists of: Dr. Kenneth Tjeerdsma, dentist and dental director; dental hygienist Rebecca Hooyer; and dental assistants Tysa Lloyd, Gabbie Lynch and Leonardo Gabriel Marquez. Promise’s dental program accepts all new patients – whether they are enrolled in Medicaid, have dental insurance or do not have insurance. 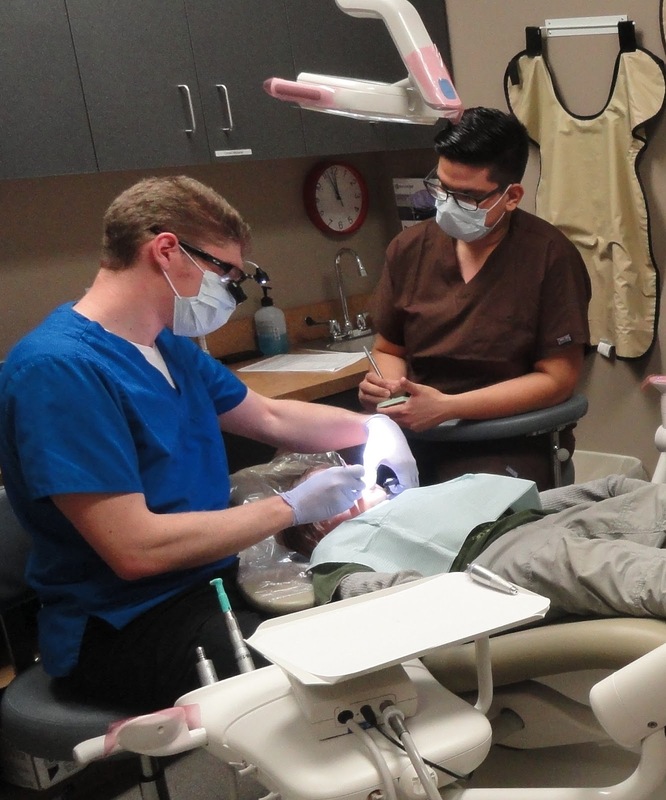 Most area dental offices are not able to take on new Medicaid patients. For those without insurance or high deductibles, Promise has a sliding-fee scale to greatly reduce the cost of dental care for families with household incomes up to 200 percent of the poverty level. The minimum payment for a dental visit is $40 for families that are at or below the poverty level. Promise also attempts to accommodate people for same-day or walk-in appointments. The dental clinic hours are: 1-6 p.m. Mondays, 9 a.m.-6 p.m. Tuesdays-Thursdays and 9 a.m.-5 p.m. Fridays. Call 712-722-1700 for more information about Promise’s dental services or to schedule an appointment. The Sioux Center Community Foundation Foundation was formed in 1997 to provide a way for individuals and businesses to make tax-deductible donations to large community projects. Since then, $7 million has flowed to various projects. Last year, the foundation also established the Generations Community Endowment Fund in conjunction with Sioux Center’s 125th anniversary as a means to distribute competitive grants to local, nonprofit organizations. Early Childhood Center – $5,000. “It is our hope that the Generations Community Endowment Fund will grow through individual gifts, bequests and fundraising events to provide a perpetual financial resource for Sioux Center’s nonprofit community,” said Kevin Wolterstorff, president of the Sioux Center Community Foundation Board, during the announcement ceremony.